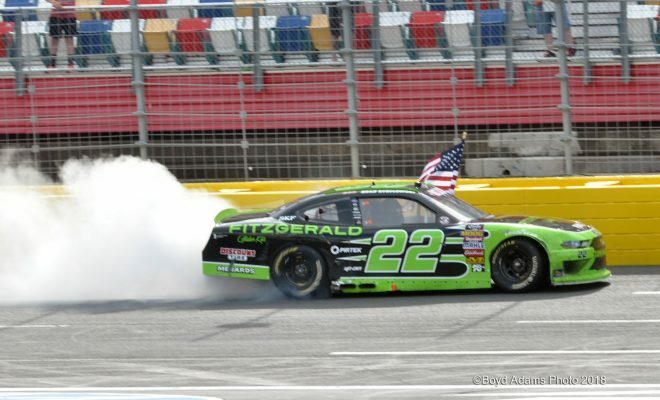 Outlasting a rain delay and an overtime finish, Keselowski won the Alsco 300 at Charlotte Motor Speedway Saturday afternoon. His victory was his second in only two starts thus far in the 2018 NXS season. 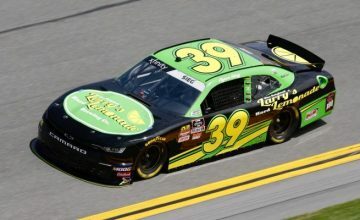 Backed by popular demand, NASCAR has continued to increase the number of NXS races that exclude full time Monster Energy NASCAR Cup Series drivers. For drivers who are climbing the series’ all-time wins list, this policy has significantly reduced their opportunity to build upon that tally. This victory was Keselowski’s 38th, tying him with Carl Edwards for fourth all-time. Though he’s a distant 53 wins away from the record – held by Kyle Busch – he’s now only 11 wins away from second place, Mark Martin. Of the six drivers to lead the 200 lap race, Keselowski led the second most, for 77 laps. Busch led for 93 circuits around the 1.5 mile track, but on a lap-162 restart he got loose when diving under Dylan Lupton between the front stretch dog-legs. Busch suffered moderate damage to the left side of his No. 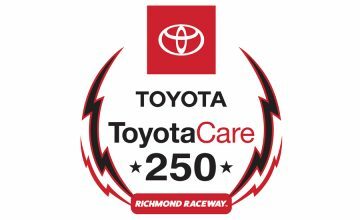 18 Toyota Camry when he collided with Chase Briscoe on the driver’s side. Busch went a lap down but by way of the lucky dog, he was able to salvage a top-10. Keselowski thought “it was definitely a perseverance day. It was brutally hot out there, the humidity was just killer. I usually don’t get that hot in a race car but it was smoking out there. I know there was a couple of times where I swear it was the inside of the car that was burning from the water and humidity. That’s just part of the challenge of racing on days like this and I’m glad to bring it home first, that’s for sure. 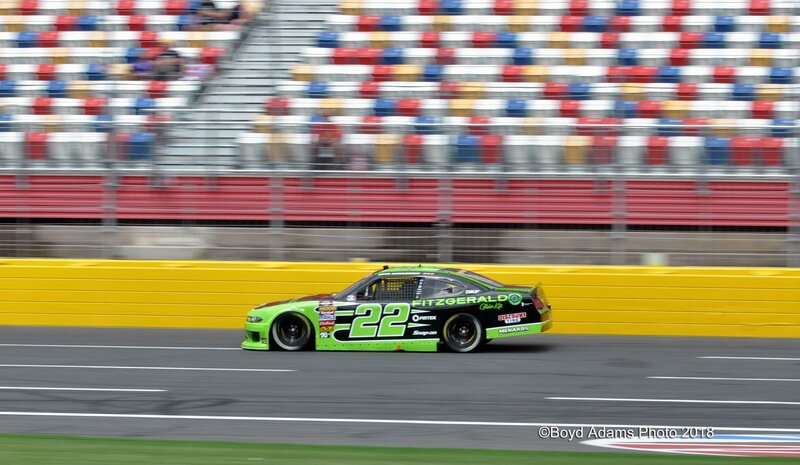 At a speed of 184.383 mph, Keselowski was the fastest qualifier for the Alsco 300. Photo by Boyd Adams. Keselowski’s winning crew chief, Brian Wilson said his race “strategy was kind of all over the place,” saying “it was definitely an up and down day for” his NXS team. They led laps early but after taking slight body damage during the second stage, the team had to do something unique to gain track position. Third place finisher, Christopher Bell said, “the old cup guy beat us,” and he may have bad luck to thank. With two laps to go a large piece of metal flew of a lapped car on the exit of turn-four. The sizable chunk of debris came to rest above the first dotted line – NASCAR had no choice but to throw a caution. 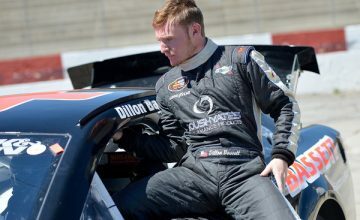 “I was just heartbroken whenever I saw that piece of debris fly off those lapped cars,” said Bell. “Felt like we were starting to make some runs there. 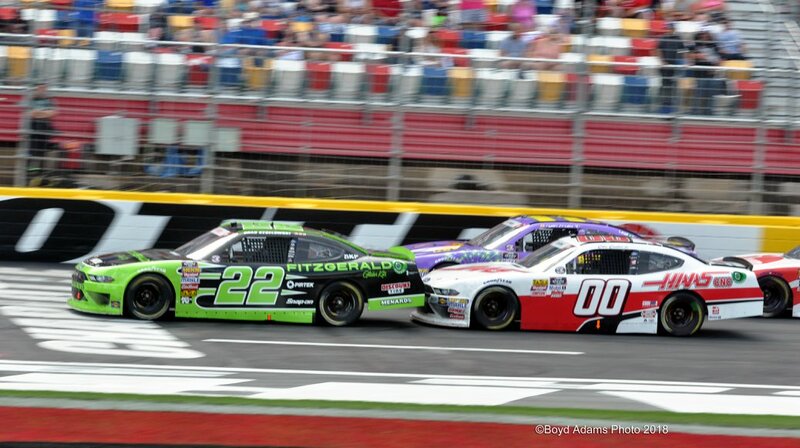 I think we were coming to two to go and I was getting the top going pretty good in (turns) one and two so felt like I was going to have a shot at him if the yellow didn’t come out and then obviously when the yellow came out, I did have a shot at him and just didn’t execute on that last restart. Inside fifteen laps to go, Custer pushes Keselowski to the lead on a restart. Photo by Boyd Adams. 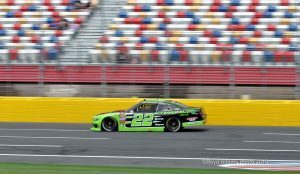 The pair of young drivers were chasing Keselowski through the final restarts. Keselowski had older tires but six cautions, over the final 52 laps, kept re-racking the field, preventing Bell and Custer from building up momentum and getting the runs they needed. “I think me and Cole were on the same strategy,” Bell said, “and we probably had the winning strategy, we just didn’t get it done.